These small group reading instruction materials are designed to help you organize and plan your literacy instruction and all toolkit materials are free. This free small group reading instruction toolkit is designed to be a free classroom resource for teachers. These resources are meant for you to use in your small group guided reading setting. They have been created so that they can hopefully be used with any texts/levels your groups are reading. Our thought is that you can spend some time printing, laminating and organizing all the resources ahead of time so that they are ready to go when you need them. We have provided most of the small group reading instruction resources in color and in black & white. After downloading the files, spend some time thinking about which resources you feel you would use. Print those pages on card stock and then laminate them for durability. Next think about how you would like them to be organized. They will need to be easily accessible and possibly portable if you will be meeting with groups in various locations. (You may also want to think about preparing an extra set for instructional assistants or other adults who may be working with your small groups too.) We suggest using a file box so that you can easily organize and label everything. 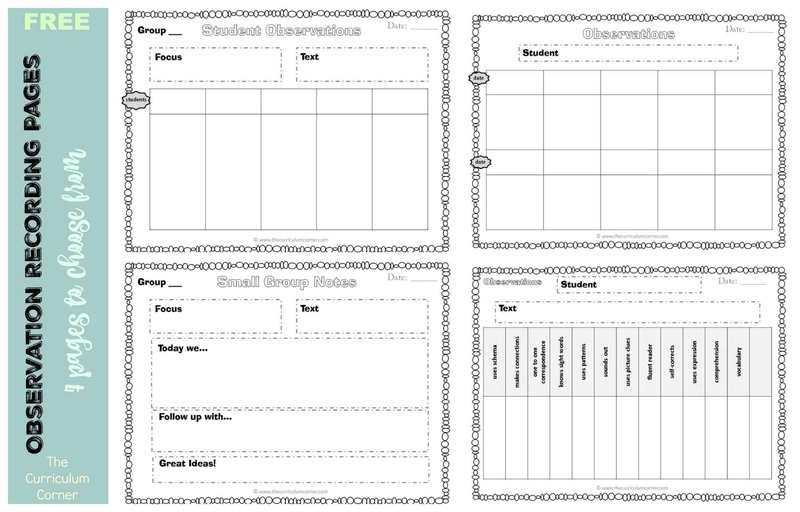 We have created a collection of small group planning and recording forms. These have been designed to help you get started with planning. Not only will they help your planning run smoothly, the forms will give you a place to record your observations and track student growth. Some of the resources in this download are great to print and have available for instructional assistants or guest teachers. You might also like our Reading Conference Guide to help you with questioning during your small groups and/or conferences. This guide was created in order to help you as you are developing your one-on-one conferencing skills. Use the resources we have created to make your own FREE guided reading toolkit. Below you will find links to all of our Small Group Resources posts to create your own personalized Toolkit. Each of the posts for small group instruction have downloads for the materials you can make ahead of time. Click on each title to be taken to the post containing the free resources. Be sure to bookmark this page so you can easily return in the future! I absolutely love all your freebies and the work that goes into them, Thanks for helping out frazzled teachers by offering quality resources!! Thank you so much for all of the work putting these resources together and sharing them with us. These allow me to print and use them quickly and keep focused on my students. Thank you! as a beginning teacher your organization materials are a time saver and so helpful! This website is incredible! Thank you so much!